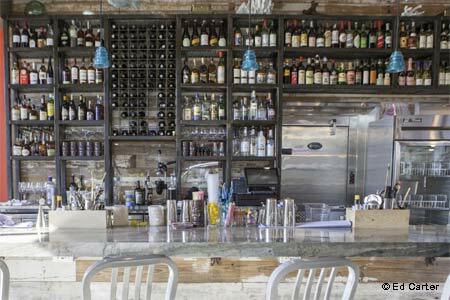 Seafood dishes explore the traditions of both coasts at this Alpharetta restaurant. About the restaurant & décor: Marc Taft launched his Southern Fried Hospitality company with Chicken and the Egg, but at Brine he focuses on seafood. A nautical theme imbues the atmosphere, which extends to a weather-protected rooftop space. A ground-level patio is another comfortable outdoor seating area. Food & Drinks: Seafood dishes explore the traditions of both coasts. Start with creamy New England clam chowder. One may order smaller or larger sizes of appetizers, so it's possible to make the clam cakes a main course with perhaps a salad. As for entrées, go for the Portuguese seafood stew; a mix of seafood and fish with a locally made chorizo (Heywood's Provision Company) finds common ground with a well-seasoned saffron-scented tomato base. Hush puppies are fine. Steak and chicken will satisfy anyone who doesn't choose seafood. Dark chocolate pot de crème is a classic sweet conclusion, and an ideal portion. The well-composed wine list is assembled with seafood in mind, so begin with the crisp Albariño or, if you're having oysters, the Muscadet. Even the red wines are seafood friendly.